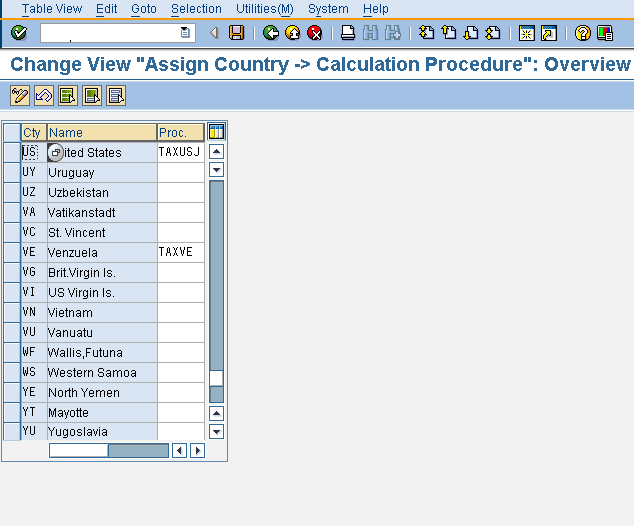 Step 2: Position to the country to which the tax calculation procedure is to be assigned and enter the tax calculation procedure details as shown in the screenshot below. Step 3: Click on the save button to save the changes. A success message showing that the changes have been saved is displayed. 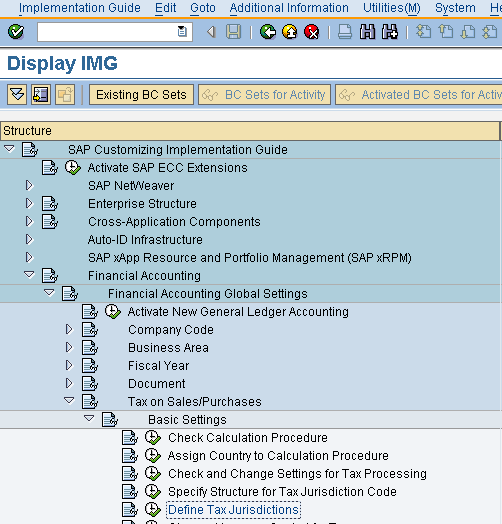 Step 1:Navigate to the implementation guide menu path as shown in the screenshot below or execute the transaction code OBCO from the SAP easy access menu. Step 2: Select the tax procedure for which the tax jurisdiction code structure needs to be defined and enter the length for the various jurisdiction levels as shown in the screenshot below. The length chosen should be sufficiently large to accommodate enough tax jurisdiction codes as per the requirement. For e.g. the first level represents the state. If the number of states is large then it is better to have a four letter key to represent it rather than having a two letter key. This is because the number of combinations possible with a four letter key will be much more than those possible with the two letter key. Step 3: Click on the save button to save the changes. A success message indicating that the changes have been saved is displayed. 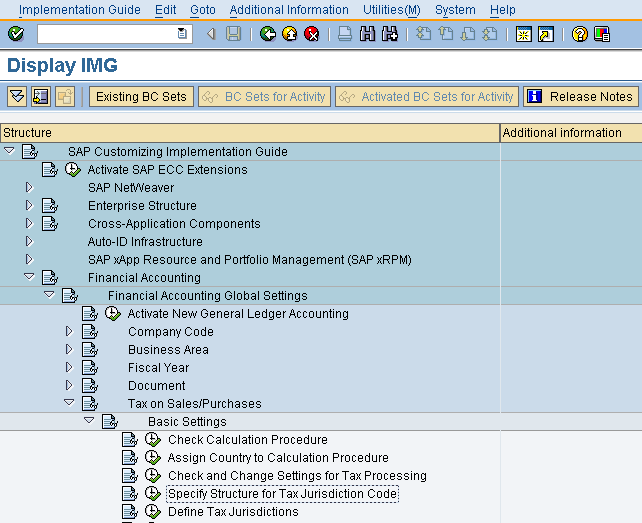 Step 1:Navigate to the implementation guide menu path as shown below or execute the transaction code OBCP from the SAP easy access menu. Step 2: Enter the work area details in the pop-up as shown in the screenshot below and click on the continue button. 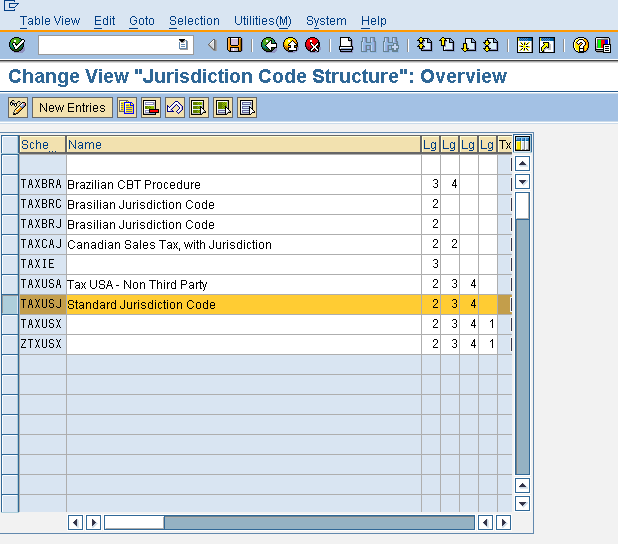 Step 3: Enter the tax jurisdiction code and its description as shown in the screenshot below. On the basis of the configuration for the tax jurisdiction code structure, the first two letters of the tax jurisdiction code will represent the state, the next three letters will represent the county, and the next four letters will represent the city. Therefore, every tax jurisdiction code will be nine characters long. It will be possible to determine the correct taxing authority on the basis of the tax the jurisdiction code described above. Step 4: Click on the save button to save the new tax jurisdiction code. 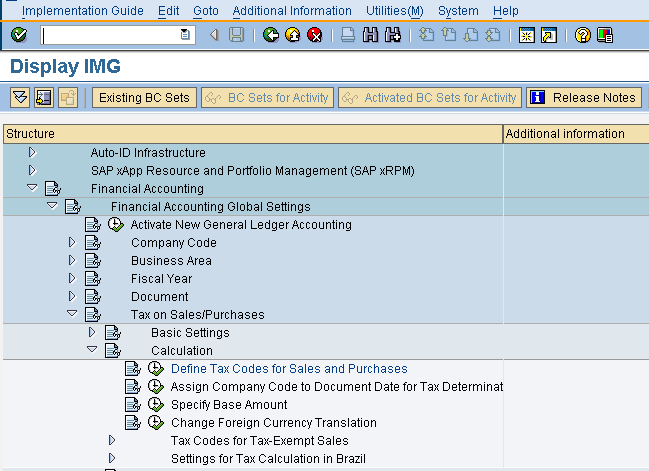 A success message indicating that the new tax jurisdiction code has been saved is displayed. The tax codes are defined for each and every country. The tax codes contain the actual rates to be used while calculating the tax on the basis of the tax calculation procedure. Each country can have multiple tax codes for different types of taxes like input tax sales and purchases, output tax on sales and purchases, etc. 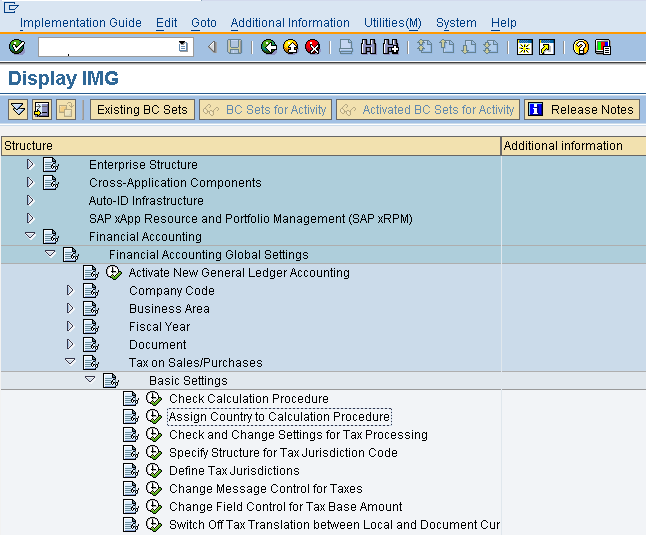 Step 1:Navigate to the Implementation Guide menu path as shown in the screenshot below or execute the transaction code FTXP from the SAP Easy Access menu. Step 2: Enter the country in the pop -up as shown in the screenshot below and click on the continue button. 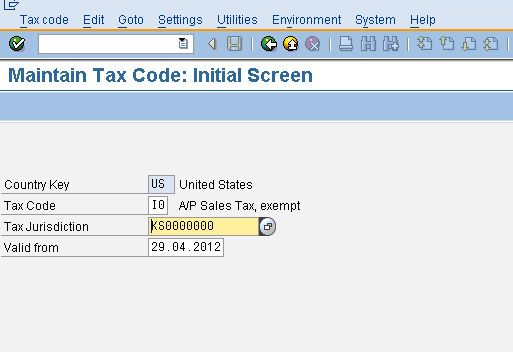 Step 3: Enter the tax jurisdiction code and the other details on the screen as shown in the screenshot below and press the Enter key. The tax code represents the type of the tax for which the rates are going to be maintained. 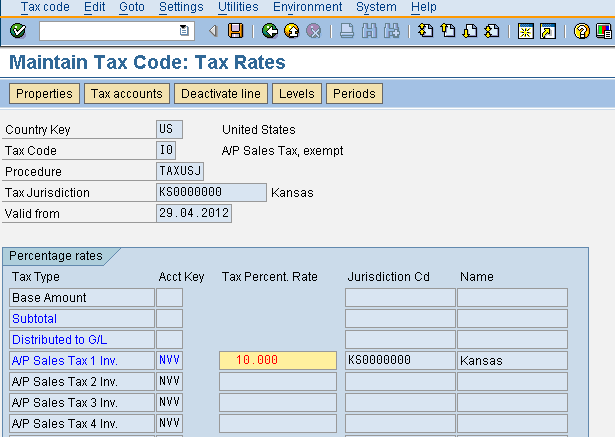 Step 4: Enter the tax rates as shown in the screenshot below. 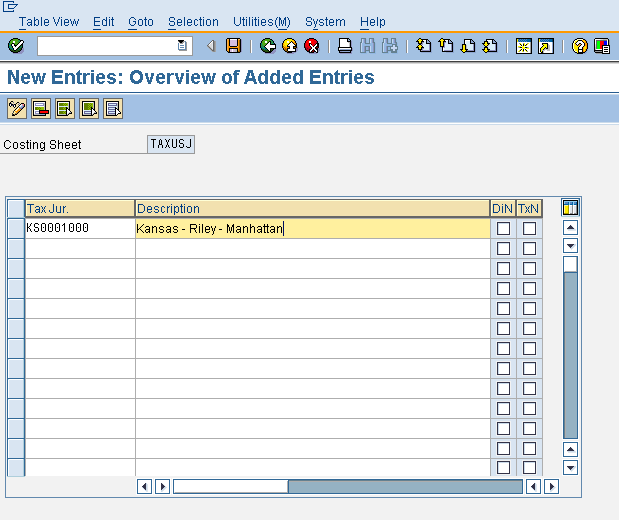 These tax rates can be used to calculate the tax while posting a document in SAP. The method of calculation will be determined on the basis of the tax calculation procedure. Step 5: Click the save button to save the changes. A success message indicating that the changes have been saved is displayed.